November 1 to 13, 2016. BACK for a 2-week run at Artword Artbar, in time for you-know-which election week! 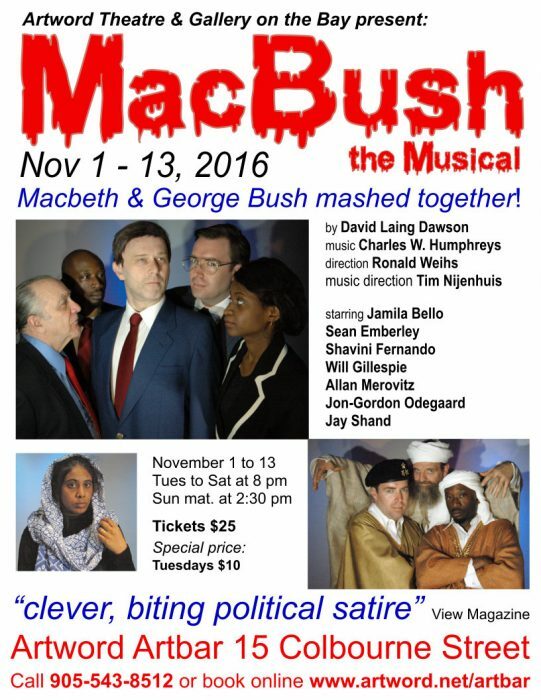 MacBush, the Musical, by David L. Dawson and directed by Ronald Weihs, is a musical mash-up of Shakespeare’s Macbeth and the George Bush administration. “Tired of Trump, Hillary and the crew dispensing ‘Ain’t America Great’ on TV? Then go get a reality check at Artword Artbar, where Artword Theatre is offering hemlock and humour, stirred not shaken, in a bitter witches’ brew. … Sean Emberley stands out as a look-alike for the grinning George Bush. Jon-Gordon Odegaard makes an exotic Osama bin Laden. And Will Gillespie and Allan Merovitz have fun with the roles of Rumsfeld and Cheney. … Well worth seeing.” (Gary Smith, Hamilton Spectator, May 2016). 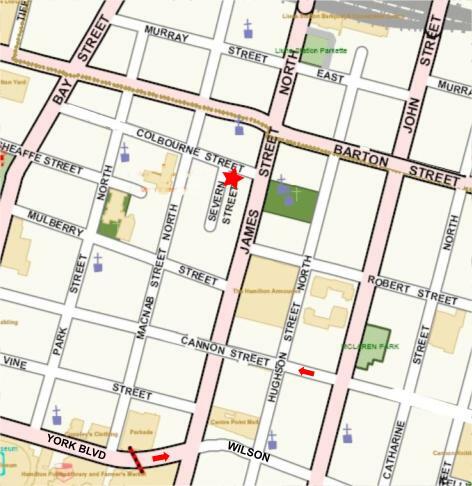 Jamila Bello, Sean Emberley, Shavini Fernando, Will Gillespie, Allan Merovitz, Jon-Gordon Odegaard, Jay Shand. Music direction and performance by Tim Nijenhuis, with percussion by Steve Foster. Directed by Ronald Weihs. Design by Judith Sandiford. Produced by Artword Theatre and Gallery on the Bay. What is this show about? G. Dubya and his sidekicks Dickie, Rummy, Condi and Coley sing jaunty show tunes while they plan tactics of ‘shock and awe’. Songs sung by a soldier and an Iraqi woman reveal other viewpoints. With guest appearances by ‘Saddam Hussein’ and ‘Osama Bin Laden’ and ‘Ahmadinejad’ as witches, who have some chilling prophecies about our now current world crisis.